Here are some great top tips to make your battery last until the end of the day. 1. Background apps Even when you exit an app, it doesn’t necessarily mean the app has been properly closed. Without double checking, the app can run in the background on your device and drain battery levels without you knowing. 2. Invest in a replacement Many phones have replacement batteries you can purchase to help give you longer battery life. These batteries tend to be slightly larger than the originals, so they come with a new backplate for you to use with your device. 3. Syncing problems Apps like Facebook and Twitter are notoriously bad for draining battery life. These sort of apps need to constantly sync to your device to keep themselves updated, but this can drain your battery life an awful lot quicker than normal. 4. Manage your screen By far the biggest user of your device’s battery life is the screen. Having it on a bright setting is a bad idea, so make sure you change it accordingly. 5. Keep track of Bluetooth Bluetooth is another popular battery killer, so when not in use, make sure it’s turned off. A great app to monitor this is Power Controls, which automatically disables it after you’ve finished using the service. 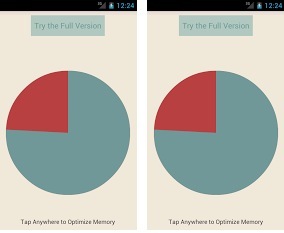 Faster phone: Use RAMbo to free up some of your current memory usage and ultimately make your phone a whole lot faster. You’ll be surprised with just how much of your memory is being used without you knowing. Task killer : Despite Advanced Mobile Care having a wide range of different features to explore, its best use is to be a task killer that can help stop applications from draining your battery life. 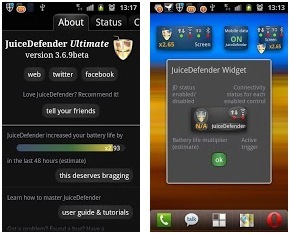 Better battery : JuiceDefender Ultimate is the app to use if you’re looking for ways to improve your device’s battery life. 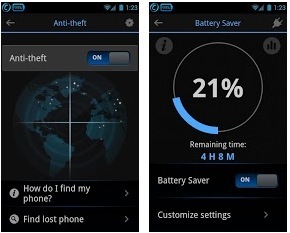 The app scans your phone to where battery usage is at its highest and looks to minimise its impact for you.